The EcoSphere or the Original EcoSphere takes it to the next level by introducing a shrimp in a similar setting. 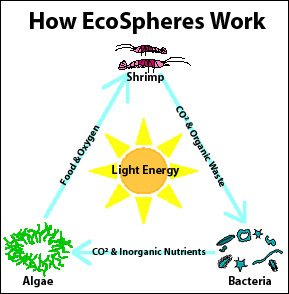 Like David Latimer’s bottle, this is also a self-sustaining ecosystem consisting of algae, bacteria and shrimp. The company that sells these things says that the shrimps would last for just around 10 years. Although, they also claim of 25-year-old spheres with living shrimps. 10 years is little as compared to the ecosystem discussed in the first point. But we are talking about a pet living in a completely sealed space for 10 years, without demanding food, change of water or an appointment with the vet. For these little creatures it is probably a safe haven away from the dirty oil slicked oceans and predators; or probably just a prison. This tiny model of the Earth could add information to NASA’s Mission to Planet Earth program for studying Earth’s biosphere. It could help NASA’s research on human life support systems directed toward the construction of space stations for exploring our solar system. Make it for yourself: Make magazine published a detailed DIY guide on how to create these living biospheres at home. [Link] Carl Sagan’s Review of these biospheres: The World Arrived in The Mail.